After the initial hold up (and frustration) with the board issues on Dr Who, progress has been moving along smoothly. Aside from that slow start, the game has been enjoyable to work on. 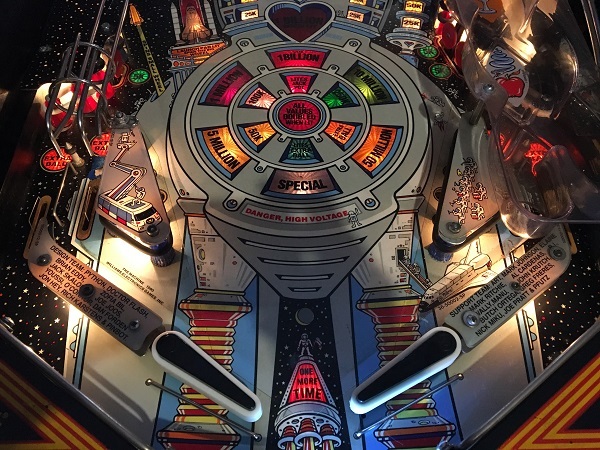 In this update I’ll be focusing on the middle section of the playfield. 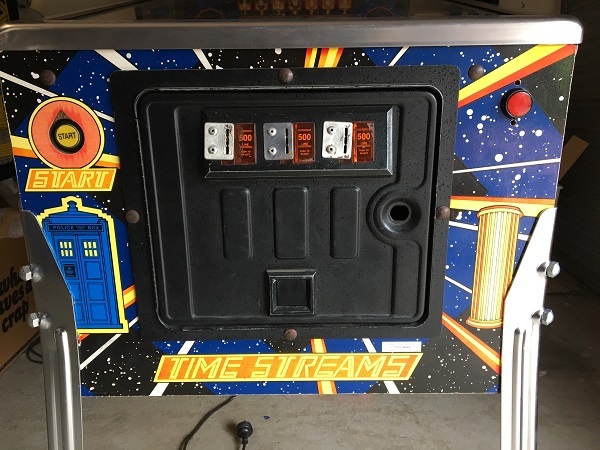 In terms of assemblies, this area has the Tardis ball popper on the right, with the left side home to the upper flipper and trap door assemblies. The popper was mentioned in a previous update as I had to replace the optics which had been cut out. This time I’ll be removing the whole assembly for a service. As usual, all plastics, targets and posts will be removed for cleaning and the playfield will also receive a clean. I’ll need to remove the ramps for this part, and won’t be putting them back on until the end. Time to get started and I’ll begin with the right side. Progress on Dr Who this week moved along really smoothly. Some weeks are like that, where everything comes together easily (which is a great counter to those weeks where nothing goes well at all). I wanted to start this update by giving the coin door a face lift. The coin door has metal panels over the three coin slots which will need to be removed. Because they are pop riveted to the door, I will need to drill them out and fill the holes. Overall the coin door isn’t in terrible condition, but has the usual scrapes and scratches from age. Replacing the old foreign pricing cards on the coin slots is on my to do list too. I spotted that the launch button isn’t correct. Notice the two small holes (one above, one below) the red button – there should be a larger button that slots in to them and so this needs to be replaced. Just before I was finishing up the previous Bride of Pinbot post, an important parcel arrived from the USA. 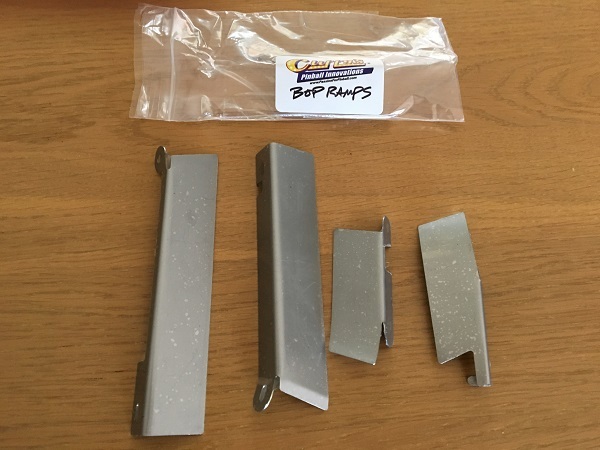 It contained the BoP ramp entry protector set from Cliffy! Due to the issues with the heart beat ramp, I was in some ways forced to replace the ramp (or leave the various hacks that had been put in place for it). I had no intention of putting the new ramp in until the protectors arrived – so I was glad to see these. I had the goal of finishing off Funhouse in time for Christmas. I didn’t quite make it. I’ve been keeping myself busy on the repair & service over the last week and am on the final stretch. First thing to look at for this update is the coin door. It’s been on my to do list for awhile now and no more putting it off. The red and orange have long since faded from the artwork and the coin entry housing is a bit scratched up. There is also a section of the decal ripped at the lower left corner of the front panel. When dropping the machine off, the owner asked me to touch this up and possibly paint the red flags and balloons to give it a bit more colour. It’s also missing the coin return housing, which I will need to source. 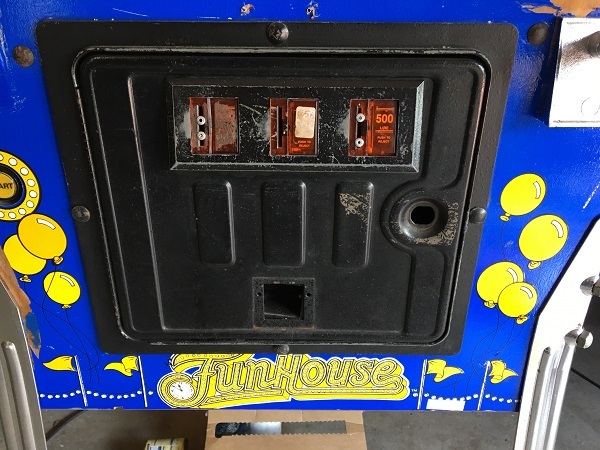 Over the last two weeks I’ve been waiting on the arrival of a parts order from Marcospec so I can continue on with my work on Funhouse. The upside to the wait is it allows me to get more done on my BoP 2.0 until that arrives. This update will be focusing mainly on the lower playfield area, with a few extra things thrown in. So assemblies like the flippers and sling shots will be rebuilt. 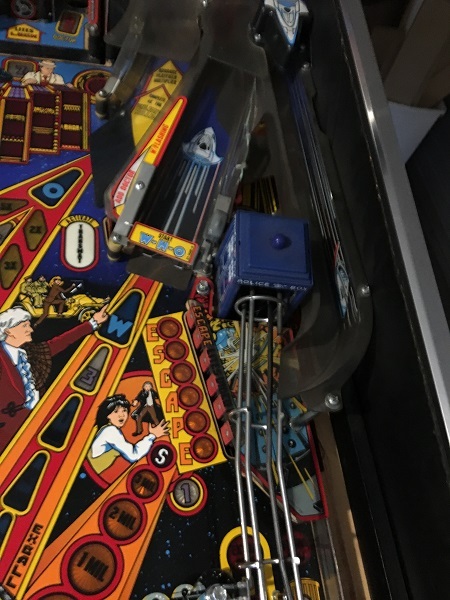 The playfield area will also be cleaned up and any metal parts like the ball guides and mini posts will head to the tumbler. I have coloured Titan rubbers to install and also LED’s from Pinball Life. Let’s get started.